The Droid Bionic sports a roomy Home screen. It’s really five Home screen panels. Of course, the phone comes preconfigured with lots of icons and widgets festooning every panel. You can customize the panels by removing widgets and icons, especially those you seldom use, and replacing them with icons and widgets you frequently use. You can also add folders to organize things, and you can even put a new wallpaper on the Home screen. Truly, you can make the Home screen look just the way you want. Rare is the individual who truly customizes things, which is probably why customizations are often appreciated. Anyone can drive a car, but the fellow who adds custom components, chrome, and a detailed paint job makes his vehicle a thing of envy. Though most folks admire customization, few actually try it. They might have a fear of screwing something up, but the benefits of customization are far better than any risk. Especially when it comes to your Droid Bionic. Personalizing your phone by changing the Home screen, rearranging apps, or setting new sounds isn’t that difficult. Changing things definitely won’t damage the phone. For the most part, the key to changing the Home screen is the long-press: Press and hold your finger on a blank part of the Home screen (not on an icon). You see a pop-up menu appear, as shown in the figure. 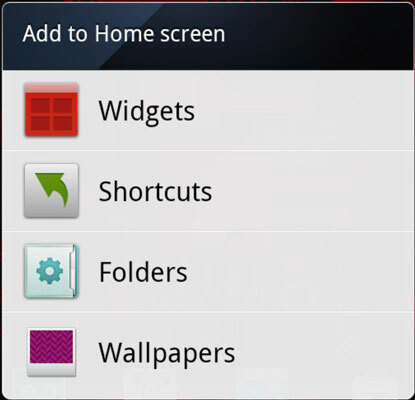 From the menu, you can begin your Home screen customization adventure. The Add to Home Screen menu doesn’t appear when the Home screen panel is already full of icons or widgets. Visit the Home screen panel on which you want to stick the app icon shortcut. The screen must have room for the icon shortcut. Touch the Launcher button to display the App menu. Long-press the icon of the app you want to add to the Home screen. Choose the command Add to Home. The app hasn’t moved: What you see is a copy or, officially, a shortcut. You can still find the app on the App Menu, but now the app is available — more conveniently — on the Home screen.